The Steelers face the Ravens in a game that will put the winner in the driver's seat for the division title. Baltimore's Ed Reed and Pittsburgh's Ben Roethlisberger did not play in the Ravens win over the Steelers win Week 4; both are back for rematch. · The Ravens offense gave the team the lead in the second quarter and the defense held it for the rest of the game as Baltimore moved to 8-3 on the season. · After a scoreless first quarter, Baltimore’s Billy Cundiff put the Ravens on the board early in the second with a 45-yard field goal. · The Ravens stopped Tampa Bay’s next drive but turned the ball over on their own. Buccaneers CB Aqib Talib snagged a highlight-reel interception off of Ravens QB Joe Flacco, setting up a 22-yard field goal by Connor Barth to tie the game at 3-3. · Flacco make up for the pick on the fourth play of his next drive, though, finding TE Todd Heap over the middle. Heap outran the defense for a 65-yard touchdown to put Baltimore back on top. · After a three-and-out by Tampa Bay, Baltimore took the ball into the redzone with the help of a defensive pass interference call. Once there, Flacco found WR Derrick Mason in the endzone for a 10-yard touchdown with less than a minute remaining in the half. Mason led the team with eight catches for 87 yards and a TD. · Both teams were quiet offensively in the third quarter, though Baltimore did have a long catch-and-run touchdown by RB Ray Rice wiped off the board by a holding penalty midway through the quarter. Rice picked up 85 yards on 20 carries and an additional 47 yards on seven catches. · Tampa Bay finally crept into the endzone with a fourth-quarter passing touchdown from QB Josh Freeman to TE Kellen Winslow from five yards out to cut the lead to seven. However, the score occurred with only three minutes remaining in the game. · Baltimore turned to Ray Rice for one final drive and the team managed to run out the clock for a 17-10 win at home. · Despite only allowing 10 points on the day, the Ravens defense registered no sacks and no turnovers. However, Ed Reed had an outstanding day with five passes defensed. Ray Lewis led the team with 12 total tackles. · Pittsburgh received a little help from lady luck to overcome another penalty-filled afternoon. Shaun Suisham’s 41-yard field goal gave Pittsburgh an overtime win to keep pace in the AFC North. · The Steelers started strong, scoring on their first two drives of the game, which extended for 13 and 14 plays respectively. · Rashard Mendenhall punched in the first score, a one-yard rushing touchdown. Mendenhall received a career-high 36 carries for 151 yards. · Kicker Shaun Suisham added the other three points one his first field goal in a Steelers uniform. That 45-yarder gave Pittsburgh a 10-0 lead. · Suisham added another field goal, this time from 46-yards out, at the end of the half to give Pittsburgh a 13-0 lead going into the locker room. Pittsburgh limited Buffalo to just 51 yards in the first half and held the ball for nearly 24 of the 30 minutes of game time. · Buffalo came out with a purpose in the second half and moved the ball well on its first possession, though they failed to capitalize thanks to a forced fumble courtesy of LB James Harrison, recovered by Troy Polamalu. · The Bills scored on their next drive, however, as RB Fred Jackson caught a screen pass from QB Ryan Fitzpatrick and shredded the defense en route to a 65-yard touchdown. · A three-and-out by Pittsburgh led to another scoring drive for the opponent. Buffalo’s Rian Lindell hit a 29-yard field goal at the start of the fourth quarter to cut the lead to three. · On the very next play, RB Rashard Mendenhall fumbled and the Bills recovered, setting up a 32-yard kick by Lindell to tie the game at 13-13. · An 18-yard scramble by QB Ben Roethlisberger on third down extended Pittsburgh’s next drive, allowing Suisham to retake the lead with a 48-yard field goal. Roethlisberger was 20-of-33 for 246 yards on the day. · Buffalo slipped into the red zone on the ensuing drive only to see Fitzpatrick turn the ball over on an interception by Troy Polamalu. · Pittsburgh’s offense stalled giving Buffalo the ball one more time. Lindell hit from 49-yards out to tie the game at 16-16, sending the game into overtime. · Bills KR Leodis McKelvin gave the Bills great field position to start the overtime period with a 49-yard kickoff return than only ended because he stumbled over his own blocker. Pittsburgh’s defense held but the offense was forced to start inside of its own five-yard line. · Pittsburgh only moved backwards, though, forcing Daniel Sepulveda to punt from the back of endzone. With little room to work, Sepulveda booted a booming 55-yarder that the return man muffed but recovered, resulting in some extra field position for Pittsburgh. · On the next drive, Lady Luck intervened. Bills WR Steve Johnson broke free of the defense and was in position for a wide-open touchdown from Fitzpatrick, but he dropped the ball and Buffalo’s drive stalled. · With new life, Pittsburgh ran the ball down Buffalo’s throat, setting up a 41-yard game-winning field goal by Shaun Suisham. 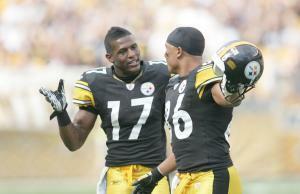 · WR Hines Ward led all receivers with seven catches for 107 yards. · Troy Polamalu finished with three passes defense, a pick, and a fumble recovery. CB William Gay had four passes defensed. James Harrison and LB James Farrior each notched a sack. LB Lawrence Timmons led the team with eight total tackles. · Pittsburgh picked up 10 penalties for 107 yards, including another roughing-the-passer call on James Harrison and four holding penalties by LG Chris Kemoeatu. Cleveland (4-7) survived a scare on Sunday, sneaking out a 24-23 win over the one-win Carolina Panthers that was only secured when Panthers kicked John Kasay barely missed a 42-yard field goal as time expired. In that close win, two things became very clear for the Browns. First, Peyton Hillis truly is as good as advertised. Against a Carolina defense that is actually underrated (the offense is responsible for their 1-10 record), Hillis rushed for 131 yards and three touchdowns and also led the team through the air with six catches for 63 yards. As long as Hillis has running room, the Browns can contend against any opponent. Second, the Browns badly need rookie QB Colt McCoy to return to action or, at least, they need to make sure QB Jake Delhomme never sees the light of day again. Carolina pushed itself back into the game largely thanks to the putrid play of their former starter (whom they are still paying a cool $12 million). During one stretch of three-straight dropbacks, Delhomme fumbled the ball, threw an interception, and then threw another interception that was returned for a touchdown. The team will hope that McCoy and hobbled super-threat Joshua Cribbs can return to health as they embark on a three-game road trip to Miami, Buffalo, and Cincinnati. Cincinnati (2-9) lost its eighth-straight game on Thanksgiving night against the Jets, resulting in at least one lost job on the roster. The Bengals parted ways with another kicker, releasing Aaron Pettrey, who missed a 27-yard field goal on Thursday. Rookie Clint Stitser will take over placekicking duties. For the Bengals, though, two others job could be in jeopardy thanks to what has been a nightmare season. Last year’s coach of the year, Marvin Lewis, will see his contract run out at the end of the season. With the team suffering through an eight-game losing streak and suffering a major decline in every area of the team, could this be Lewis’ last year in Cincinnati? Even more intriguing is the fate of former first-overall pick Carson Palmer, who went from looking like the next elite quarterback to looking like the second coming of Ryan Leaf (OK, he’s not that bad, but you get the point). Palmer’s QB rating in his last five seasons as a primary starter (excluding his four-game 2008 campaign): 101.1, 93.9, 86.7, 83.6 and a 78.5 this season. While he will likely exceed his 2009 totals in yards and touchdowns, he is also on pace to set a career-high in interceptions, with a lot of those picks coming in key situations. Considering that Cincinnati is in the running for a top-three pick in the 2011 NFL Draft, critics are wondering whether it’s time to let the declining Palmer go in favor of a new highly-drafted QB. The fact that his football team didn’t blink in the face of adversity and made critical plays at critical moments in all three phases of the game. Tomlin specifically cited his quarterback’s third-down scramble, Polamalu’s interception, the defense’s first stand in OT, the 55-yard punt by Sepulveda, and Shaun Suisham’s four-FG performance. QB Ben Roethlisberger suffered a foot sprain on Sunday and is currently in a walking boot. He will likely miss some practice this week but, given that he returned to play on Sunday, he should be PROBABLE against the Ravens. DE Nick Eason (MCL sprain) and CB Bryant McFadden (hamstring) both left Sunday’s game and will likely miss practice time this week. They’ll be QUESTIONABLE for Sunday. TE Matt Spaeth is also QUESTIONABLE after missing Sunday’s game with a concussion. S Troy Polamalu will be limited in practice as a precaution as he deals with an ankle injury. He’s been playing through it and will be PROBABLE to play this week. DE Brett Kiesel (hamstring) should practice this week and is PROBABLE to make his return after missing a handful of games. WR Antonio Brown (knee) worked out on Tuesday and is also PROBABLE for Sunday night. FB Le’Ron McClain suffered an ankle injury against the Bucs and is QUESTIONABLE for Sunday night. The fact that the team signed FB Jason McKie to the roster may be a sign that McClain isn’t ready to return. LT Michael Oher (ankle) and OG Chris Chester (bacterial infection) are also QUESTIONABLE against the Steelers. S Dawan Landry suffered a concussion on Sunday, meaning he’ll have to pass the necessary tests to return. As such, he is QUESTIONABLE this week. Who will rule the AFC North after Sunday? If Pittsburgh wins, it will even up the series, eliminating Baltimore’s tiebreaker and putting them a full game ahead with a better division record. If the Ravens win, they’ll be up by a game and a half thanks a series sweep. Essentially, whoever wins is in the driver’s seat for the division crown and one of the two top seeds in the conference. · QB Joe Flacco started his collegiate career at Pitt before transferring to Delaware. · Strength and conditioning coach Bob Rogucki coached at Penn State (1981), while assistant strength and conditioning coach John Dunn played at Penn State (1974-77) and later coached for the Nittany Lions (1978). · Wide receivers coach Jim Hostler was born in Pittsburgh and played (1986-89) and coached (1990-92, 94-99) at IUP. · QB Marc Bulger grew up in Pittsburgh, played at Central Catholic High School, and played collegiately at West Virginia. “There were many instances in the game where we were getting penalties and then boom; we were overcoming them immediately whether it was the next play or converting a third down. I understand that that is not always going to be the case and that is why I said moving forward, playing a team like Baltimore, we have to be careful with putting our team in those circumstances. But largely throughout that game, I thought that we were able to overcome the penalties that we sustained throughout the course of the drives, at least offensively. So for that reason I was less concerned about them during the course of the game, it is just something that stands out to you after the completion of the game when you are evaluating your work.” – Discussing why he wasn’t overly concerned about the team’s penalty woes on Sunday, prompted by a question involving OG Chris Kemoeatu, who racked up four holding penalties by himself. “The significant thing or difference for them in this game, on the back end, is the presence of Ed Reed. And we all know what the presence of Ed Reed means, proceed with caution when attacking him vertically down the field. This guy has missed a significant amount of action. He has four interceptions, one of which he pitched to a teammate that ran it back for a touchdown. This is an unselfish, top-notch and quality playmaker, so we have to reckon with him. If there’s a significant difference in preparation for this game than the last one, it’s the acknowledgment in this existence of Ed Reed.” – On what the return of Ed Reed means for Baltimore’s defense. Reed missed the team’s first six games due to injury. “We don’t always match them personnel-wise. Oftentimes, particularly in first-and-ten and second-and-medium when people go three wides, if we chose to, we still stay in our base defense of personnel. The offensive personnel doesn’t always dictate what we do from a personnel standpoint. It is the complete picture. It is offensive personnel, field position, down and distance. All of those things dictate to us which people we chose to employ so the offensive personnel alone never dictates that to us.” – When asked if offenses have the advantage in that they can dictate what type of personnel is used by the defense. For instance, the Bills ran a lot of three receiver sets, spreading the field, which meant that NT Casey Hampton saw less snaps than usual. “Sacks don’t always measure success in terms of pressure. The way the ball is distributed and the time in which the ball is delivered has a lot to do with it. I think they have put consistent pressure on opposing passers. The tape tells me that.” – When asked about Baltimore’s low sack total this year. The team’s 19 sacks is tied for a sixth-lowest total in the NFL. A perfect example of what Tomlin is talking about here would be how Drew Brees affects opposing sack totals. Brees sports a quick release and has no issues spreading the ball around to both primary and secondary targets which, in turn, makes it much more difficult for teams to turn a “pressure” into a sack. “I thought William Gay specifically responded to the challenge. He was competitive and combative. He made plays, he challenged throws. I think maybe he had four pass break ups. His play is as significant as Troy’s on Troy’s interception down there in the red area because he made the initial break up and of course Troy made an incredible catch on the interception. But William Gay stepped up and made some significant plays, particularly in the latter part of that game.” – On the performance on CB William Gay, who was thrust into the role of second cornerback with the injury to Bryant McFadden. “Quite frankly it was a really good route and an even better throw, and thankfully he didn’t catch it. But I don’t worry about those things. I thought Emmanuel Sanders had an opportunity to catch and run for a score in regulation where none of those plays even exist. I‘m not going to cry about our drop; I hope they don’t cry about theirs.” – Discussing the crucial drop by Bills wideout Steve Johnson that would have won the game for Buffalo in overtime. A different game than the first matchup between these teams. In that week four contest, each team was missing one of its biggest stars. Pittsburgh’s Ben Roethlisberger was still serving his suspension and Baltimore’s Ed Reed was still on the team’s PUP list. “We have an opportunity to go into a hostile environment versus a good team in prime time football and win. When you look back at our journey that has been the 2010 season, we haven’t been successful in that situation. In New Orleans we didn’t play as well as we’d like to have played. So this week provides an opportunity on that front for us, to kind of exercise the man versus himself battle. We've got a desire to be good in all areas, situations and circumstances, and really the opponent is irrelevant.” – Talking about this week’s matchup against the Baltimore Ravens, which will be the team’s fourth primetime game this season and third on the road. Pittsburgh is 1-2 in those first three games and 1-1 away from Heinz Field. “Life isn’t fair. I am not concerned about fairness. I am really not.” – When asked if it’s fair that Harrison’s fines (he picked up another $25k fine this week) are similar to those levied against Texans WR Andre Johnson and Titans CB Cortland Finnegan, who were involved in a fistfight on Sunday resulting in ejections of both players. They have since been fined $25k apiece but will not be suspended. “There very well may be two dogs and two bones.” – Answering whether he would consider dressing both Emmanuel Sanders and Antonio Brown (if healthy) at wide receiver. “We’re different, they’re different. It’s all going to wash out. We’re all the same. We were close in record the first time we played. We are both 8-3. It’s what we’ve come to expect from those guys. We just try to uphold our end of the bargain in terms of the rivalry and be a competitive, good team when we face each other. I think we’ve done that. I think we’re going to give our fans a top-quality game. I look forward to seeing Steeler Nation in Baltimore this weekend. It’s going to be awesome.” – When asked about the differences between the two teams from their last meeting.